Mobile Training Center - BEST Inc. 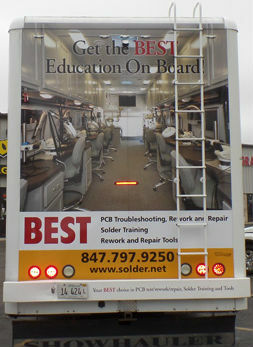 The BEST Mobile Training Center (MTC) is the only self-contained solder training center on wheels. We can just pull up to your facility with everything you need for training! The MTC has been all across the continental United States. It has all of the conveniences of a modern electronics work bench including stereo microscopes, ESD protection and professional hand tools. In addition, there's an extraction system for operator comfort and a compressor when using solder extraction tools. Click Here to take a virtual tour of the MTC! Click Here to view the Power Requirements for the MTC.